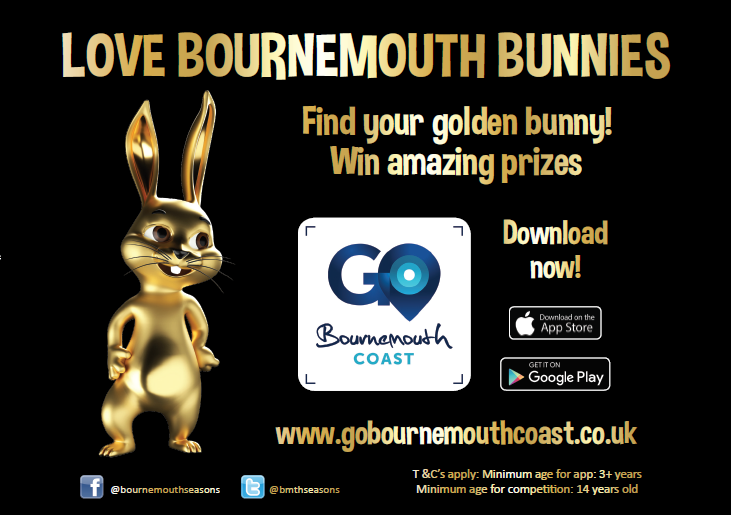 Last year’s hugely successful Love Bournemouth Bunnies Easter competition is returning with a new augmented reality twist on the Go Bournemouth Coast App (GoBoCoast)! Upload their bunny photos to social media through the GoBoCoast app using #GoBoCoast in order to enter the prize draw! Scan the marker (logo) on the poster with the camera feature on the app. Unlock the bunny in relation to the location. Using the app, the virtual bunny should appear on the phone screen. Customers can then take their photos with it, as well as the physical bunny in store! Tell your media contacts about your involvement in this campaign. Following last year’s success, [business name] has joined the Love Bournemouth Bunnies campaign, which includes a prize competition and new augmented reality feature. Last year thousands of people took to Twitter and Facebook, sharing their great experiences while participating in the competition. This involved discovering and taking photos with golden bunny statues. The new competition challenges families to find as many golden and virtual bunnies as possible between the 15th March and 9th April 2018. Uploading more bunny selfies will unlock different game levels on the GoBoCoast app. Each level will include a draw for a local shopping voucher of an ever-increasing value, with 6 images or more needed to enter the top draw for a £1000 shopping voucher to spend in [business name] and other participating businesses. For more information about Love Bournemouth Bunnies competition visit www.lovebournemouthbunnies.info or connect via social media; Facebook (@bournemouthseasons) Twitter (@bmthseasons). Be creative and have fun! Place bunnies in different scenarios e.g. Make sure your business name is visible in all images! Tag @bournemouthseasons on Facebook & @bmthseasons on Twitter & we will make sure to share your posts with thousands of people seeing your business!